Coating slide surfaces has been done with a variety of adhesives such as Poly-L-Lysine, chrome alum and other materials but they are not suitable for immunogold labeling because of increased background caused by attraction of gold particles to the slide’s adhesive. The surface of glass slides is uneven and is activated by the silicon tetrahedral structure. Active sites are then provided for adsorption of proteins or reactions with chemicals and reagents. A coating material of low reactivity towards reagents minimizes this possibility. 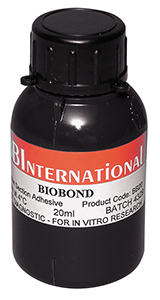 Biobond produces a very strong adhesion between the glass and the tissue section for subsequent incubations. Biobond coats a glass slide with a protective layer to minimize interaction of charged glass surfaces with reagents. This is important for reproducibility of results because of variations that occur between glass slides obtained from different sources and in different countries. It is very effective when used under severe incubating conditions such as those encountered for in situ hybridization. Biobond is suitable for all kinds of tissue specimens including paraffin wax or resin sections, cell smears, cytospins or cryostat sections. It is supplied in 20ml volumes sufficient to coat at least 1,000 slides. 0.1% w/v aqueous solution; preservative. 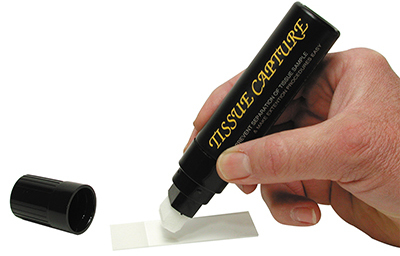 Adhesive for tissue sections on glass slides. Immunohistochemical techniques, gold labeling, microwave procedures.